During TGCat processing there are several summary products created for browsing purposes. These images are displayed for each extraction on it's own summary page ( navigated to by clicking the "v" link or one of several columns in the extractions data table. All of the summary products can be downloaded at once by selecting the "SUM" option when downloading data. A flux spectrum, adaptively binned to provide a minimum signal-to-noise ratio and a minimum number of bins, plotted on a logarithmic energy and flux density scale. This is used for a uniform overview of the extractions (and is the pop-up plot as you move the mouse pointer over the results table's obsid or object links). For LETG/HRC, the flux is approximate, since order-sorting cannot be done, and this fluxed spectrum often shows artifacts. Counts spectrum (counts per bin) for summed positive and negative orders (first orders only, if ACIS). For LETGS, the background has been subtracted (ACIS background is usually negligible). 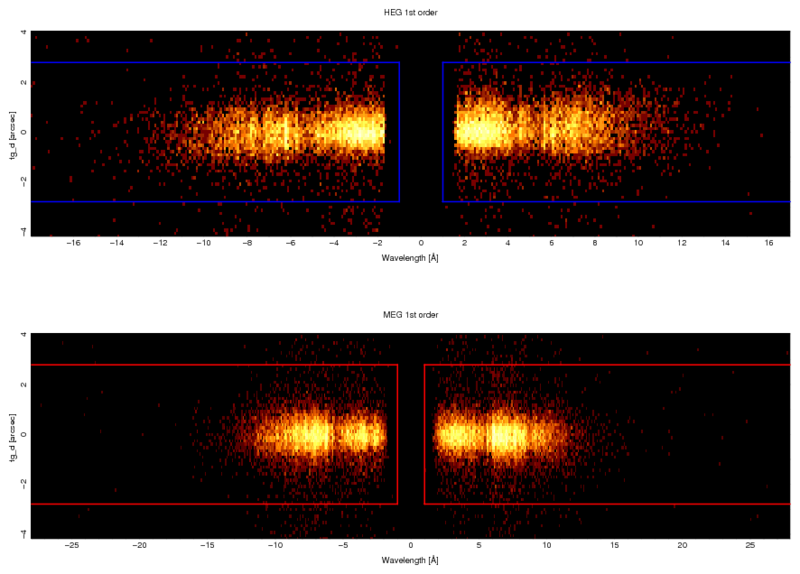 For LETG/HRC-S, the first panel shows a broad spectral range, and subsequent panels show expanded region. For HETG we show the HEG and MEG separately. 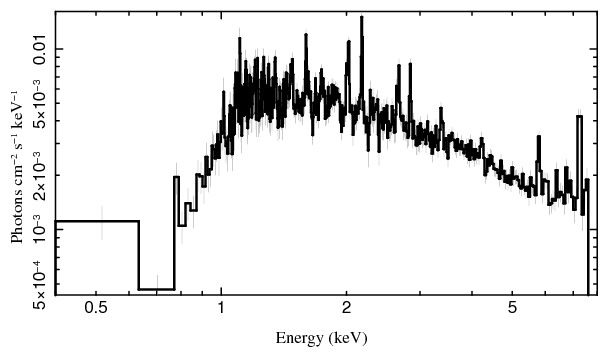 Light curve of the source from the diffracted events, in 1 ks bins (except for some short CC-mode observations which have smaller bins). The count rate was determined for orders -1 and +1 from the spectral binning region. For HETG, HEG and MEG counts were combined. 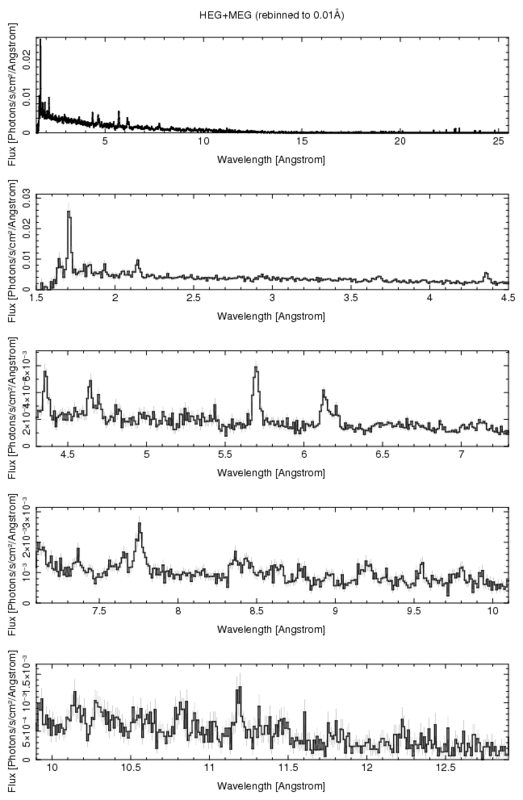 Background light curve in the middle panel (if any) from the background region adjacent to the dispersed spectra. The count rates have been scaled to the source region size. Net rate (bottom panel, if any background light curve exists). Images of the zeroth order region. 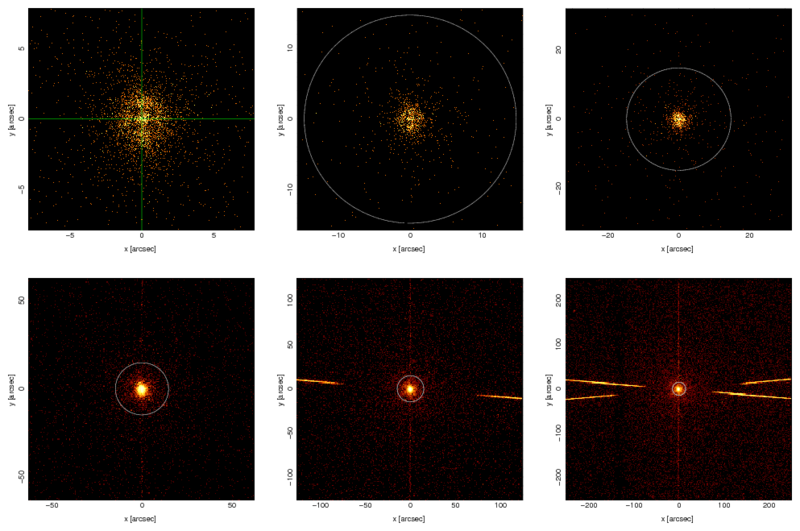 The first image has cross-hairs showing zeroth order position. Other images step out for 5 factors of 2, and have circles showing zeroth order region. Images are in rotated sky pixels, such that the long axis of the detector is horizontal, and positive orders are to the right. Image of the field in sky pixels, but rotated to make the long axis of the detector horizontal. Positive orders are on to the right. The green arrow points to north, and the green bar points east. The outline shows the grating part regions (if HETG, red outlines HEG and blue MEG). The aspect ratio is not square. Image of the field, in grating dispersion coordinates, order*wavelength ("m*lambda") on the x-axis, cross-dispersion angle on the y-axis. The outline shows the grating part region(s). The aspect ratio is not square. This file is a standard FITS binary table of count rates and fluxes integrated over bandpasses. 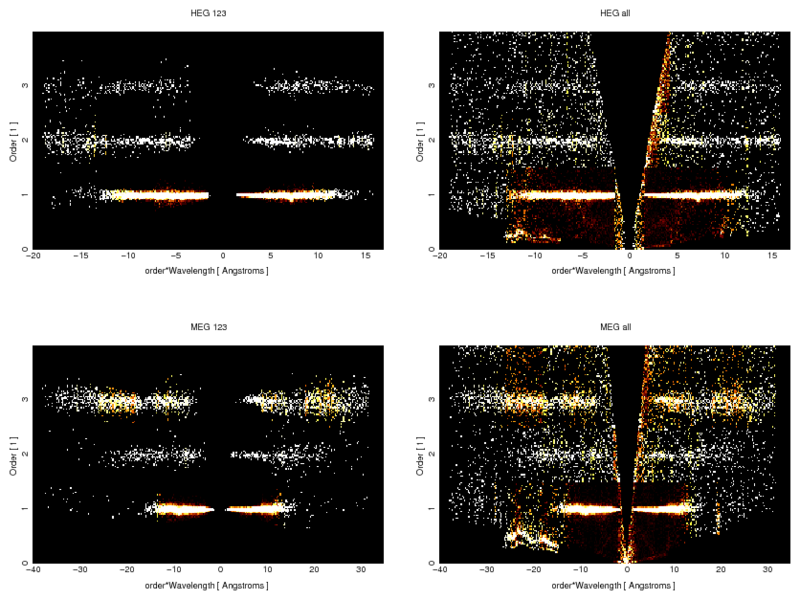 These are counts per bin or flux per bin summed over all bins in a a wavelength region. There is no continuum fitting or subtraction or line profile fitting. Statistical uncertainties are also provided for each band. 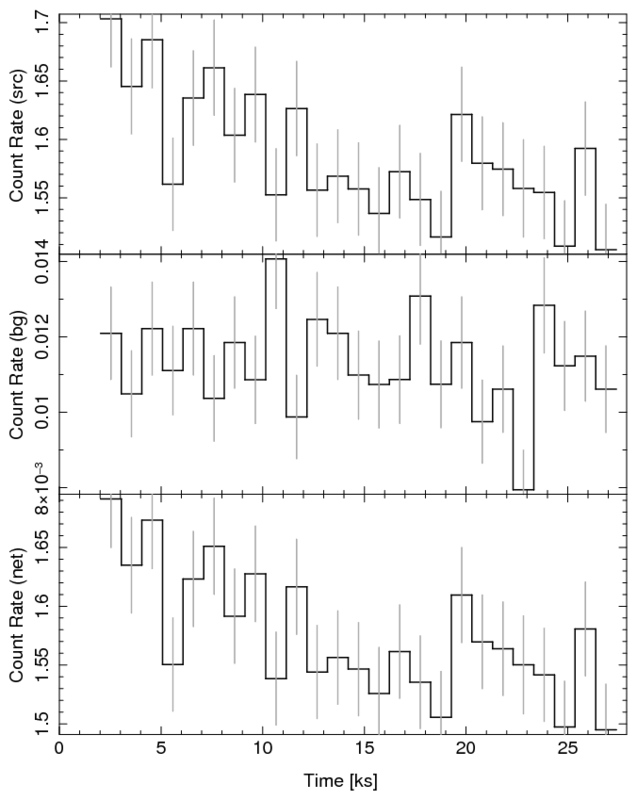 For LETGS, counts are background subtracted, but flux values have not been computed since they are model-dependent due to overlapping high-order contributions in the counts. Values are assigned a label indicating the dominant element and ion appropriate for a typical coronal thermal plasma in the region. Near each such band is a "continuum" band, labeled with a "c". To obtain an approximate line rate or flux, the continuum values can be interpolated and scaled to the line bandpass using the tabulated "wlo" and "whi" values giving the banpass, and then subtracted from the line rate. For continuum sources, the line labels are irrelevant. The band wavelength midpoint, "wmid" is also tabulated. 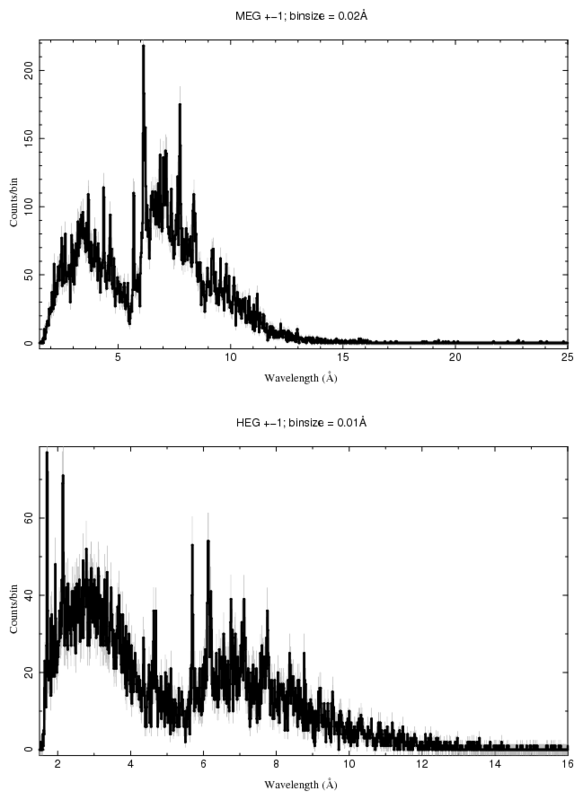 Broad-band rates have also been given for the HEG, MEG, LETG/HRC, and LETG/ACIS spectral ranges. Rates are also supplied for the Chandra Source Catalog "science energy" bands and are labeled with a "csc_" prefix and a band mnemonic character ("b", "u" "s", "m", and "h"). See information at http://cxc.cfa.harvard.edu/csc/columns/ebands.html for detailed definitions. We also provide zeroth order rates, but it must be realized that for many sources observed with ACIS, the zeroth order is saturated either by photon pileup or by telemetry limits. Count rates are in units of [counts/s], photon fluxes are in [photons/cm^2/s], and energy fluxes in [ergs/cm^2/s]. If a bandpass is truncated by the sensitivity limits, or if the effective area is zero-valued somewhere within the band, then the value in the "flag" column will be non-zero (e.g., "letgs_band" for HETGS observations). Only the broad-band rates are optionally available for display on the source extractions tables in tgcat ("View -> Change Display Columns"). These rates are intended to be used for qualitative characterization of spectra. Detailed modeling is required for determination of rigorous values.